ARM’D Paediatric Consult Tassie was a great success, read Diana’s excellent review below. I attended a one-day workshop: Paediatric emergencies for GP’s at Cradle Mountain Lodge on the 20th of April. This was run by Dr Michelle Davison, a paediatric emergency specialist from The Prince Charles Hospital in Brisbane. She devised the course with the understanding that many BLS style courses are designed for hospital doctors and are not always that helpful for primary care. The course is accredited by RACGP and ACCRM for CPD and BLS certification, and is eligible for 1 day emergency grant/ funding for those working in appropriate areas. The course was an excellent day. We revised BLS quickly for both adults and paediatrics. This allowed completion of the RACGP BLS requirements/ certification. We then moved on to cover 8 different emergency scenarios in a simulation type setting. The focus was on pre hospital management, and what is achievable in a situation that is resource poor. A take home refresher of the things that alter management was helpful, and was reassuring in that simple things done well do alter outcome. Don’t forget that glucose in the unwell child! The venue was lovely and the weather put on a summer style show for mid-April, which added to the enjoyment of the day. The style of the course was supportive, multidisciplinary and engaging. Dr Davidson was happy to tailor the course the participants needs and clinical experience. I would be happy to recommend this course to GP’s and registrars at all stages of their careers who are looking to refresh their management of infrequent and often daunting situations. This is a full day Paediatric Emergency simulation course (6.5hrs learning excluding breaks) that is designed for General Practitioners, Rural Generalists and Registrars and Trainees who are following the FRACGP, FACCRM or Diploma of Emergency Medicine Pathways as well as nursing staff working with clinicians in these acute care settings. Prior to the course participants must complete a CPR theory module and undertake pre-reading on CRM and Simulation. Small Group Practice of Paediatric Simulations. The CPR training component teaches BLS and CPR skills and assessment touching on both Adult and Paediatric resuscitation. The larger part of the courses is the Small Group Paediatric Simulation practice. 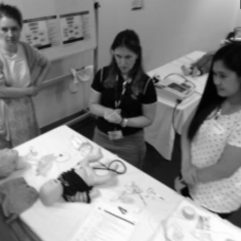 Participants in small groups experience a series of hands on facilitated paediatric and infant resuscitation scenarios covering a range of conditions that may present and deteriorate in a primary care consult. These scenarios have been developed and are fully debriefed by Adult and Paediatric Emergency Physicians who have specialist training in debriefing ensuring participants gain the most out of their simulation experience. A post course MCQ one month post course must be submitted and assessed. Participants will then receive a Certificate of Completion and the college will be notified of the course completion for allocation of CPD points. Demonstrate effective CPR and Basic airway manoeuvres including BVM. Discuss the need for defibrillation and apply an AED as part of a BLS algorithm. Analyse available clinical information and recognise deterioration of the paediatric consult. Demonstrate appropriate acute resuscitation of a range of paediatric conditions. Communicate acute referral of the deteriorating paediatric patient effectively to ongoing care providers and follow up any issues with their team. Each course has only 12 – 16 spots available for doctors and a further 2-4 spots for clinic nurses.